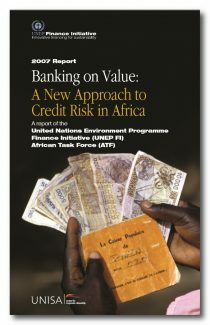 “Banking on Value” assesses the extent and manner in which financial institutions in Africa’s largest financial hubs – South Africa and Nigeria – currently integrate sustainability in their core financing activities. The report contains a section on policy making designed to assist African financial institutions with policy refinements that integrate environmental, social and governance issues into credit risk assessments. In addition several recommendations to encourage the uptake of sustainable finance in Africa are provided.